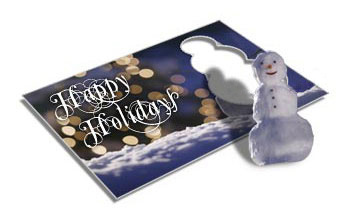 Bring in holiday customers looking to spend with snowman die card postcards. These festive cards measure 4” x 6” and include a die cut pop out in the shape of a snowman. Make the holidays extra jolly for your customers by turning these die cut cards into coupon mailers. Place your discount information on the snowman to create a fun coupon your customers will enjoy putting to use. Our holiday postcards are printed on sturdy 14pt ultra-thick cardstock. You can print in full color on both sides, if you wish. Choose between a high-gloss UV coating and matte finish for your card. However, if you plan on writing on the cards, we suggest choosing no UV or matte finish. We offer fast turnaround time of 3 days when your press-ready files are in by 6 pm PT. Competition for retail customers is fierce over the winter holidays. Let customers know you want their business with snowman die cut postcards. These winning holiday postcards feature a snowman-shaped die cut pop out. These clever cards get customers’ attention, especially when you include a discount! Snowman cards can also be used for bar and restaurant marketing anytime during the winter season. In addition to being used as coupon mailers, snowman postcards can be put to work by small businesses as part of a gift card program. Use the front of the snowman die cut to write in custom gift denominations, and the back for a signature. Your customers will enjoy getting these cute cards with a personalized touch.